Doctor Who entered 1970 not just with a burst of color but also with a new modern style and feel and a total revamp of the program’s format. I think that this becomes evident at the outset with our stylish introduction to new companion Liz Shaw, a film-like close-up of her ride in the car. Everyone’s demeanor and interactions are so much more serious and even dark that it feels like an entirely different series. The realistic quality is helped by having most everything filmed on location with just a few sets; the actual inside of gritty factories and English cottages are used to good effect. Robert Holmes begins his string of famously strong stories, in this case with interesting sci-fi ideas and laying the groundwork for the hustle and bustle of military exercise and scientific investigation by UNIT that becomes the new standard of the program. 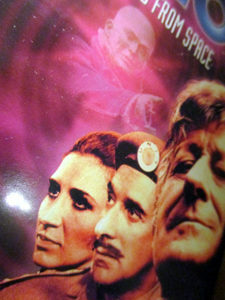 The other centerpiece of the first episode is of course the arrival of the new Doctor, and Pertwee jumps into the role well. There are many now staple elements that get introduced like the Doctor’s post-regeneration confusion, people being baffled by his physiology, his self-induced healing coma, his tries at various costumes. At the same time, Pertwee’s flamboyant take on the personality of the Doctor (who could imagine Troughton’s Doctor in such a shower scene?) definitely puts a stamp on the character and reminds us that we are in a new era. Most significantly, this story is much more adult in its treatment of horror; there are true jump scares galore as the Auton dummies come to life, and when innocent by-standers are shot down they crumple in horribly realistic death throes. The fear of poor country wife Meg as she shakily holds up a shotgun to the blank-faced creature stalking her down is quite believable as well. There are many good little ideas and shots throughout this concise and well constructed story—Channing through the prism glass, people hidden amongst the waxworks of Madam Tussaud’s–but it is of course the last episode and the iconic scenes within it that really stand out the most. The Third Doctor comes across really well as does Liz Shaw with their immediate rapport as scientists and investigators. Though we already know that one of the dummies behind Ransome will come to life, the actor plays it so perfectly still that you really have no idea which one it is, making the moment when it jerks to life very surprising. This same jolting effect is used in the awakening of the dummies in the iconic shop window scenes as they begin breaking out of the store and and decimating a group of early commuters at a bus stop. Without me knowing it at the time, this was actually my first experience with Doctor Who as a young child, having passed by the window shop scene on PBS as a young child. I quickly turned away scared and discomforted, and it was only years later watching this episode that I realized I had seen it much earlier on. While the on-film nature of the episode lends it a certain style, it also leads to the choppy editing and jump cuts that I unfortunately feel are characteristic of the Third Doctor’s era. The Doctor’s ending struggle with the tentacles is often acknowledged as a campy weak point in the story. The title has never been a favorite of mine either; it doesn’t evoke much of the focus of the story.